Home › News › Calling all Zine Makers!! 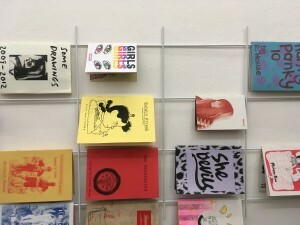 The Feminist Library wants to archive and showcase copies of YOUR zines and independent publications…. We are asking makers to donate 1-2 copies – these will go into our Library to be preserved and shared for years to come, and will also be showcased as part of our upcoming pop-up Library at Tate Modern! The spirit of self-publishing and rebellion has always been at the heart of the Feminist Library. We have a growing collection of contemporary zines, and we’d love to have more to share with our visitors and future feminists. …or drop in during our opening times! If you would like them shown at the Tate Exchange pop-up please send them by 16th April or bring them to us at Tate Exchange 20-22 April.